Specials Welcome to the KC Signs online store. Check out our specials below or use the links above to view additional categories. 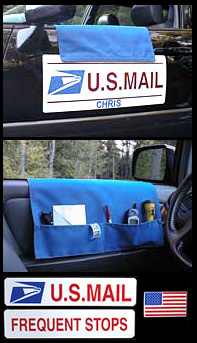 Postmasters or Rural Postal Carriers: orders over $100 get FREE SHIPPING! Welcome to the Rural Carriers and US Postal Carrier Online Store. 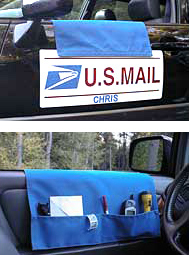 KC signs offers a full range of supplies and equipment for postal workers and rural carriers. We have been supplying magnetic rural carrier's signs for over 20 years, and we believe that we have the best quality at the best prices. All of our magnetic signs are made of .030 thick materials and have rounded corners for maximum holding power. We have static cling signs, magnetic signs with removable pouch, strobe lights and lots more for the needs of all rural carriers and US Postal Carrier workers. If you don't see what you need, please call and we can customize your sign. We offer your name FREE on any door protector with every order. Every order is shipped within 24 hours priority mail. KC Signs provides rural carriers prompt service to meet the needs of U.S. Postal Service and rural carrier workers. Please feel free to call our toll-free number with any questions or to place an order at 1-800-545-2217 or Email Us.